Pattern Description: The pattern consists of 3 horizontal bands of decoration: paneled top, diamond/hexagon band in the middle, and diamond panels around the bottom. This Lancaster pattern with vertical panels on the top, a row of filled diamond shapes and then a bottom row of unfilled diamond shapes is easy to identify once you have seen it. 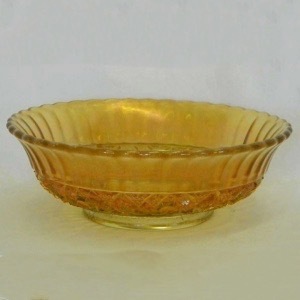 Currently reported in a 9″ bowl with a plain interior, it is one of the many geometric external patterns that would have allowed you to use this rather than just have it as decoration. The pattern was introduced in 1915.